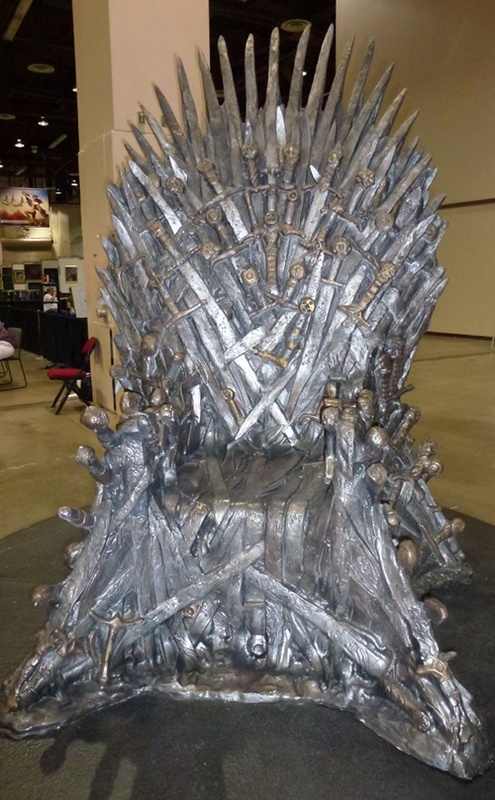 This was in the convention showroom at WorldCon Reno for people to sit in, have their photo taken, and imagine they wielded the power to choose who lives and who dies. I’ve been on blogcation but working very hard. My rewrite deadline for STARTERS is this month. I asked my editor if she would look at how I’ve handled her notes, and then give me one more pass at it. This is the first time I’ve done this, and I want to be sure it’s right. Her notes were all small but even small changes can make a difference. And I’m obsessive — this is my first book, after all (pause to jump up and down). I know so much about my world but I also want to balance that with the thrust of the story, so that’s mostly what I’m working on at this stage. And I’m also layering in elements that will set up book 2. It’s so exciting to think that people I don’t even know will be reading my book. Wow. Love that show. And the books, of course. I’m almost done with Dance of Dragons, the latest installment.